Speculative geography of the Pacific northwest includes the mythical Sea of the West and De Fontes apocryphal discoveries. Doubtless this map's most interesting features in the large inset in the upper left quadrant illustration Vaugondy's speculative geography of the American Northwest. The map features the Sea of the West (Mer de L'Ouest), the discoveries of de Fonte, the discoveries of Bernarda, the Strait of Anian, and the mythical kingdoms of Quivira and Teguaio. Vaugondy has here placed the entrances to De Fonte's lake and river system in modern day British Columbia somewhat north of Vancouver. We can recognize the Lac de Fuentes as well as Lac Belle, and the Rio de los Reyes. Many of the water communications here are conjectural but would later be echoed by Buache de Neuville, a bitter enemy of the Vaugondys. Lac de Fonte seems to roughly correspond with Great Slave Lake. Another legacy of the De Fonte voyage appears further north in the form of passages extending in a northeasterly direction towards Lac Velasco, thence via a river communication to the high Arctic, as well as another ship's route passing through the Bering Strait and then heading eastwards toward Baffin Bay. This refers to the travels of Pedro de Bernarda, a sub-Captain under Admiral De Fonte. According to the legend, on the 22nd of June, De Fonte dispatched Bernarda northwards where he discovered a large lake full of islands, which he named 'Velasco' after the Governor of New Spain. He then traveled through the Bering Strait and sailed eastward almost as far as Baffin Bay. The travels of Bernarda are marked here skirting the coasts of Alaska and the Canadian Arctic. There is also a river named after him called the Rio de Bernarda. Like De Fonte, Bernarda was most likely fictional but his explorations were nonetheless used by Captain James Ross in his 1835 argument for a possible Northwest Passage. Most notable is the illustration of a large Mer de L'Ouest or Sea of the West. The Sea of the West occupies the greater part of the northwestern part of the continent. This body of water, alternatively called the, was initially speculated by Philippe Buache and De l'Isle in the early 18th century based upon wishful thinking, American Indian stories, and the somewhat questionable 16th century explorations of Juan de Fuca. Here Robert de Vaugondy has appropriated the idea and associates the discoveries of Juan de Fuca and Martin d'Aguilar with river entrances to this vast inland body of water. While Vaugondy embraces the Mer de l'Ouest at its fullest expression, he specifically does not connect it to either the factual network of lakes and rivers extending westward form the Hudson Bay or to the speculative De Fonte network just to the north. Vaugondy would later abandon the notion of a 'Sea of the West' as unlikely, however, he consistently supported the equally fictive discoveries of De Fonte until the explorations of Cook resolved the question. This map was first issued as plate no. 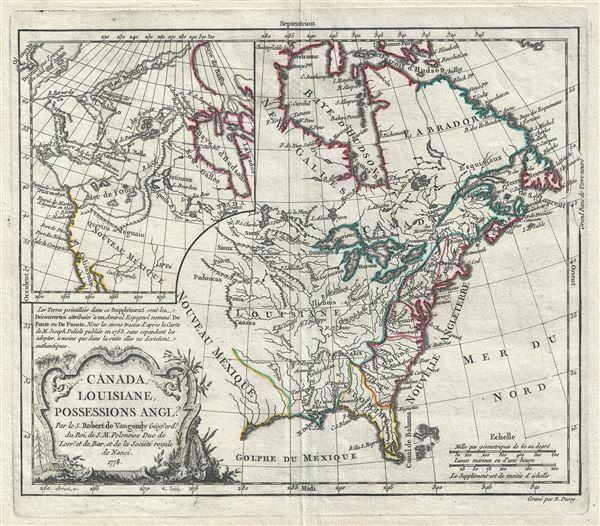 43 in the 1762 first edition of Vaugondy's Atlas Portatif. It exists in three states, this present example, from 1778, being the second. No significant cartographic changes appear in any of the three states, although the imprint is updated. Very good. Original centerfold and platemark visible. Blank on verso. Strong clear impression. OCLC 5448846. Library of Congress, Map Division, G3300 1762 .R6. Pedley, M. A., Bel et Utile: The Work of the Robert de Vaugondy Family of Mapmakers, 449, state 2. McCorkle, B. B, New England in Early Printed Maps 1513 - 1800, #778.15.